Awnings can be so much more than the logo-bearing cafe dome or eye-catching storefront. We tend to think of them as a commercial mainstay, but awnings can serve many purposes and come in a number of varieties. There are many benefits to having an awning, including added shade, decreased energy costs, and even boosted curb appeal. And with all the options available to you when choosing an awning, it can be easy to find the perfect awning for your needs. Retractable awnings, in particular, are extremely versatile additions, as they can be brought out and folded up as needed. This makes them a great choice for commercial and residential use alike! Here are just a few of the reasons retractable can be a great, versatile addition for you. 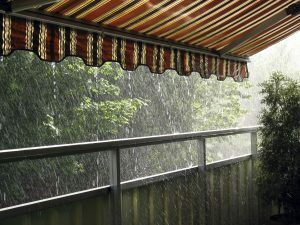 Retractable awnings are hassle-free. Folding and unfolding your retractable awning requires very little effort since there is none of the frustrating assembly and disassembly of the traditional awning made of various rods and other parts. Retractable awnings are easy to store, and many are even automatic, meaning you can set up and put away your awning as easily as pushing a button. Enjoy a clear view as often as you like, and when you need shade, simply press a button and enjoy the outdoor space with your retractable awning. One of the things that makes retractable awnings so versatile is their lack of required maintenance. Since you can retract your awning so easily, they won’t be weathered and torn in inclement weather, collapse with snow buildup, or require frequent replacement due to standard wear-and-tear. Since you can easily store and protect your retractable awning, you won’t need to worry about repair costs or expensive maintenance. Beyond this, awnings can save you money in energy costs by providing shade and protecting your windows from unforgiving UV sunlight and hot temperatures. Lastly, awnings are highly customizable. One of the most versatile aspects of retractable awnings is the style itself. You can choose between a variety of awning materials and fabrics to find the right look for your home or business. There are plenty of options that allow you to pick the right size, shape, style, color, and fabric for your unique retractable awning needs. Plus, you can always add a design to your awning or even change the fabric, later on, to change up the style!